War Memorial called ‘The Thinking Soldier’. Broughton’s War Memorial stands on the corner of High Street and Scawby Road, on land that was once part of the Red Lion. The owners "The Hull Brewery Co." gave the land to the village in 1924. The Memorial was unveiled on Sunday 22nd of October 1923, by the Earl of Yarborough. 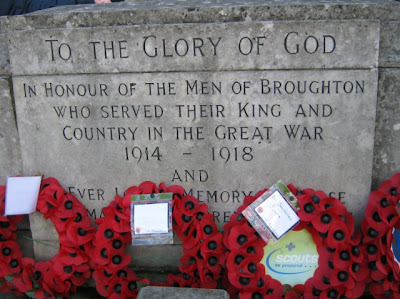 It was paid for by money collected from the people of Broughton , who wanted to remember their dead from the first world war.